Sundry events have kept me offline and intermittently out of the loop. I have some serious catching-up to do. I just got back from a couple of days hanging with author Laurie J. Marks and her wife Deb Mensinger, after spending several days at her place the previous week. I was there to help out, because Laurie suddenly had some major surgery. But not to worry! All is well. A large but fortunately benign tumor was discovered, and had to be removed ASAP. And a hyserectomy was performed along with it. So, rather a lot of surgery. Deb’s own health is not great, and she does not drive at all — so my job was to chauffeur from the hospital, go shopping, bring casseroles from Sabine, and clean whatever needed more scrubbing than the others could manage. Laurie is recovering with amazing swiftness! By Sunday, I drove her and Deb out to a local nursery, where they spent a good long time in the fresh air and sunshine, walking around and picking out a variety of plants. Then we hauled ’em all home, and they potted them (Laurie working cautiously from the comfort of a big Adirondack chair), and Deb arranged the result on their front steps. Remember that storybundle I took part in a couple of months ago? Well, if you decided that you like the whole storybundle idea (a bunch of ebooks for one combined very low price), there’s one going on right now called “Myths and Legends.” No, I’m not in it — but Cat Rambo is. I tell you this because there are only a couple of days left to grab the storybundle, and Cat’s contribution is Beasts of Tabat, the first book in her Tabat Quartet series. 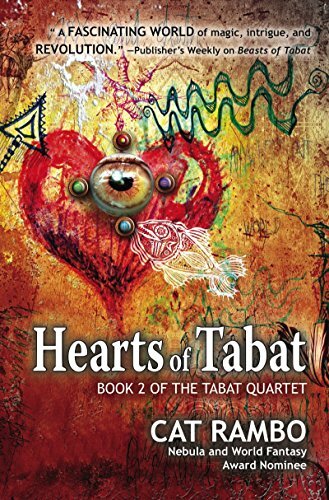 And I tell you that because the second book of the series, Hearts of Tabat, has just come out. Cat is the person who curated the Feminist Futures storybundle that included The Steerswoman. Also, our current SFWA president. Also, a nominee for both the Nebula and World Fantasy awards. Just sayin’. And here’s a thing of which you might not be aware: If you are a Kindle owner, you actually can download short samples of books you’re thinking of buying, totally free. So, if you’re on the fence, or too reluctant to commit bucks to something you might not like, just try a sample. Both Beasts of Tabat and Hearts of Tabat can be sampled this way through Amazon. And that brings me to another thing I like about the whole ebook phenomenon in general: it encourages you to try unfamiliar authors. Back when I first started reading SF & Fantasy (approximately one million years ago), a paperback cost about the same as a bag of potato chips. A book by someone you never heard of before did not set you back, didn’t eat up your disposable income. Even a kid like me could buy both a paperback book and a bag of potato chips. The price-point on ebooks is often so much lower than the paperback or hardback versions, it’s once again worthwhile to take a chance on something totally new — and with that sampling option, you can even try before you buy. Sabine and I did manage to get some of our planned improvements done, but others were postponed for various legitimate reasons. We had some seriously nasty weather roll through our part of the state, including what were later identified as three small tornadoes! They did not hit our town, but one of the towns affected was quite nearby. The biggest damage in our condo complex resulted from a very tall, narrow, but lovely old oak crashing down on the ranks of mailboxes by the road. But this caused us to push back some of the tasks that needed sunshine. And then, we pushed back more tasks, since I found I had to schedule physical therapy twice a week for both my shoulders. I’ve been having some pain for a while, and finally admitted that it was not going to go away without real help. I blame bad author ergonomics. We’ll see if it helps. Too soon to tell. 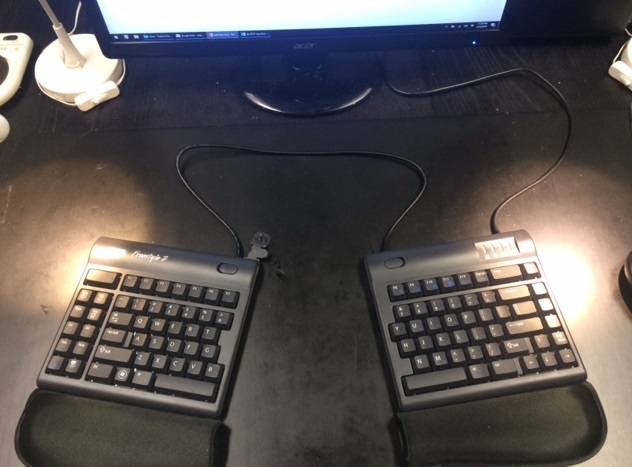 But it’s already nice to be able to type without always keeping my hands front-and-center. Finally: that AMA looms a mere nine days away. Line up your Q’s and I’ll do my best to A.